16874 Lance Corporal George Caddoo M.M. 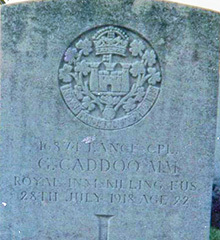 George Caddoo was the son of David and Rebecca Caddoo, of Tyghan, Greystone, Dungannon, Co. Tyrone. George was born about 1897. Prior to enlisting he had been employed by Stevenson & Son of Moygashel, the linen manufacturers. George was a member of Derrygortreavy Company, Dungannon Battalion, U.V.F. He was also a member of Derrygortreavy Parish Church and Kilnacart L.O.L. 296. 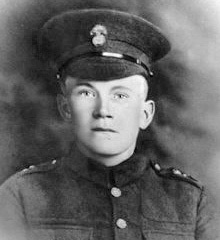 Lance-Corporal George Caddoo was serving with the 9th Battalion Royal Inniskilling Fusiliers when he died of wounds on 28th July 1918, aged 22. Lance-Corporal George Caddoo was awarded the Military Medal for the single-handed capture of a German machine-gun, which he turned on the enemy, so enabling his section to advance with safety. The village of Arneke is approximately 50 Kms south-east of Calais and about 8 Kms north-west of the town of Cassel. Leave the village of Arneke on the D11 heading north. After 1.3 Kms turn right at the crossroads. The Cemetery is 500 metres on the right hand side. 5 War Graves Photographic Project Photo of George Caddoo's headstone can be purchased here.